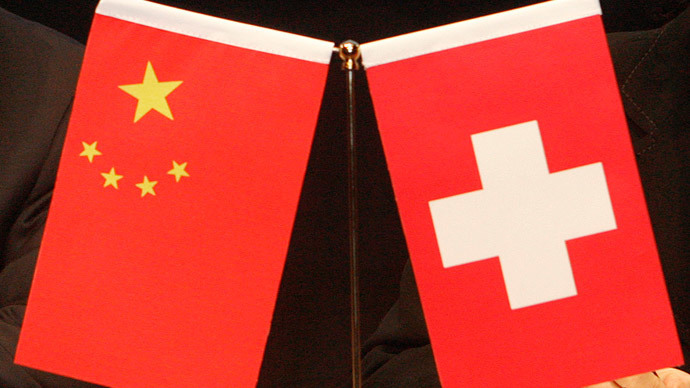 The central banks of China and Switzerland have signed a pact to establish a yuan trading center in Zurich. The deal is expected to increase the number of European transactions in yuan. Switzerland's central bank said on Wednesday it had signed the agreement with the People's Bank of China. The deal was concluded during the visit of Chinese Prime Minister Li Keqiang to the World Economic Forum in Davos. “It [the arrangement] will promote the use of the renminbi by enterprises and financial institutions in cross-border transactions, and promote facilitation of bilateral trade and investment," the Swiss National Bank said in astatement. In July 2014, the central banks of China and Switzerland signed an agreement on a $24 billion (150 billion yuan) currency swap to boost bilateral trade and economic relations. China, the world’s second largest economy, has been pushing the yuan as a rival to the dollar in the global financial system since 2010. In November 2014, the Bank of China started to operate European yuan clearing in Frankfurt. The Chinese yuan is traded directly against the dollar, euro, the Japanese yen and Russian ruble among other currencies. Settlement worldwide in yuan reached $485 billion (3.01 trillion yuan) in 2013 compared to $330 billion (2.06 trillion yuan) in 2012.